Softest thing ever! I love to jump onto this and wrap up after a long day. It stays cool and I love that. It has the perfect weight too! Yes - get it. With a soft, silky tencel cover and luxurious Hungarian white goose down fill, this European Heritage comforter is the perfect way to add warmth and comfort to your bedroom. 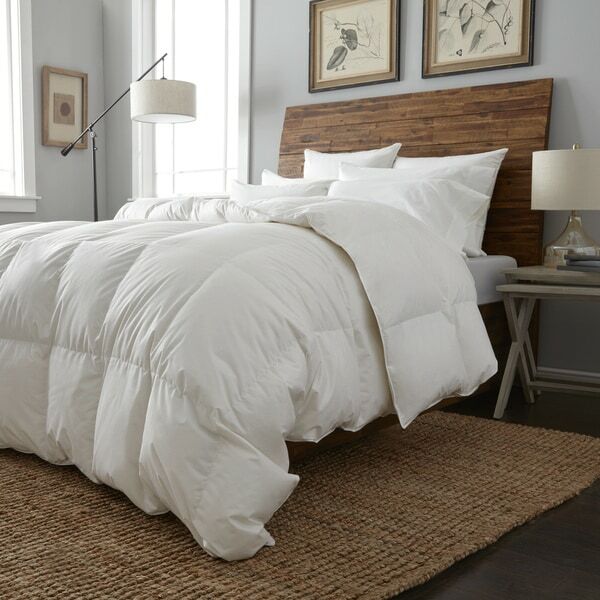 The Tencel cover is a natural fabric manufactured from wood pulp of Eucalyptus trees and is very silky to the touch, yet light weight and durable, while the down in this comforter has a 650 fill power and has gone through a multiple wash and rinse process to ensure it is hypoallergenic. This comforter may be dry cleaned, or washed in a front-loading commercial capacity washer with a low sudsing detergent or a product specifically designed for washing down products. This comforter is a good quality comforter but it is too heavy. A down comforter should be light, in my opinion at least. The material on the comforter is a great quality. If you like a heavy comforter, this might be for you. But I found it oppressive. This comforter is so lightweight and cozy. Good quality. No bad smell from goose down. Very happy with my purchase. Well worth every penny! I've slept great ever since this purchase! It's fluffy, cozy, and warm. Very good quality. Will be purchasing more of these for additional bedrooms. "Does this comforter have baffle box construction?" Yes, and it is amazing quality!